Is Your Fumigator Only Giving You A Half Tank Of Gas? Are Your Fumigators Giving You Estimates For A Full Tank Of Gas? Or, are they Only Quoting You For Half A Tank Of Gas? Take a look at these two pictures of homes and you’ll see exactly what I’m talking about. 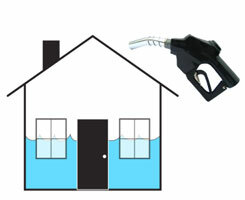 As you can clearly see, the house on your left has only a half tank of gas. The house on your right represents our bid and as you can see, it is completely full. Have Found It Necessary To Cheat And Use Less Gas In Their Bids! 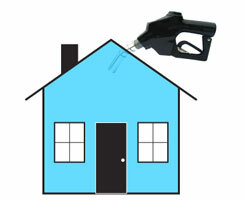 Did you know that if everyone carefully measured homes and used as much gas as we do, their bids would be much higher than ours? Unfortunately, most home and business owners are not aware of this dirty little “secret”. These same people wrongly assume that all fumigation tents are the same and all they do is look at the price. What they don’t know is that they are getting a bid for a fumigation that won’t work because not enough gas is being used. Hey, I admit it! Our price will always be higher if we’re using twice as much gas and I’m proud to say that! I have no desire to compete with someone that does “shoddy” work. How Do You Know That You’re Getting The Right Amount Of Gas? I’m glad you asked and the answer is simple; Have your fumigators measure up your home or business and make sure that they put their measurements in writing. Make sure they explain their measurements, too! But, let me warn you in advance, you’ll find that very, very few actually use a measuring wheel or tape measure. In fact, you’ll be astonished at the number of fumigators our there that don’t know how to measure a building and couldn’t calculate your home’s measurements if their life depended on it. 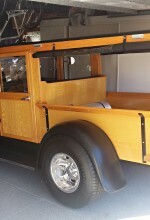 At Termite Terry Pest Control, you’ll see that we always put our measurements in writting with your bid. And, if you’re concerned about our numbers, please join us and we’ll re-measure your home while you watch. We’ve got nothing to hide and we’re proud of our work. We’ll Get Rid Of All Your Termites Or Your Treatment Is FREE! That’s right! If within two years, you find a colony of live drywood termites anywhere in the structure that we fumigated, we will re-tent for FREE and we’ll refund your entire investment! Many have asked me how we could possibly offer a guarantee like that when no other company will dare to match our offer. The answer is simple; If you measure a house up correctly, use the right amount of gas, use good fumigation tarps and seal it up right – The termites will all die and your problem is solved! But, if your fumigator is guessing at sizes, putting in half the gas he should and he’s using old worn out fume tarps, you are wasting your time and money! What difference does it make if the other guy’s price is $200, $400 or $1,000 less? If his treatment won’t work, it’s useless AND HE SHOULD PAY YOU FOR THE INCONVENIENCE! I hope you’ll use this information to make an informed choice. And, if you find someone that will beat our price, give you everything you need and match our MONEY BACK GUARANTEE, go ahead and hire them. But, do you really think I’d make that offer if I thought anyone could? To schedule your service, please call our office at (949) 631-7348. Don’t forget about the other great benefits we have to offer you, as well. We always like to meet with you before we start the job to help you prepare. Another thing we need to do is to go into your home’s attic, garage and substructure (if you have one) to cover up all of the old termite evidence (We do that so that next time you or anyone else goes in there, you’ll be able to see if there are any new signs of termites). 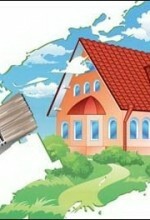 Annual maintenance service is also available. And, if you schedule your job within ten days of your inspection, don’t forget to ask for your $240.00 worth of FREE BONUSES! Call us today! (949) 631-7348. 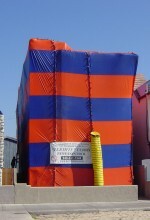 Do you have concerns or questions about termite fumigations? Click on U.C. 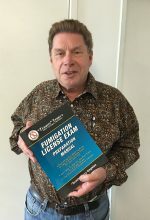 Berkely’s link below for the latest information, a new fumigation safety study be Dr. Robert Krieger and frequently asked questions.